Spring = so many pretty things. 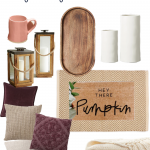 The hardest part about decorating for spring was not buying all the spring home decor items. 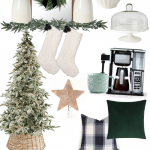 This year, I’ve really been digging the natural elements with pops of color mixed in. I added some green into my decor with my green pillows and botanical print while also using some pink because what’s spring without some pink? 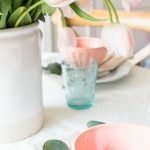 Since I couldn’t buy everything this season, I thought I would at least share with you all of my spring favorites. Maybe you’ll find one or two things to add to your decor to refresh your space. 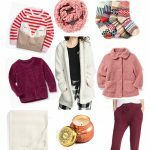 I’m sprinkling in a few other favorites that I’ve actually purchased and loving this season as well! That ruffled sleeve tee with a pair of distressed jeans is basically my new everyday outfit. What are you loving now that spring is here? I am loving the outdoor hanging lights! Makes me ready to grill out and have Spring parties! Chelsea! Did you ever make pillow cases from your pretty tea towels from world market you posted on Instagram a few weeks ago? I would so be interested in seeing more of that! Maybe a tutorial??! Hey Carrie! I actually didn’t buy them but you are right that would be a great tutorial. Stay tuned! Okay so I want one of everything! We have banana leaf pillows on our patio and one of those fair trade baskets holding our fiddle leaf plants. But I’m totally lusting over the pineapple drinking cup! I saw one at Target that I should have snatched up! don’t you love those pineapple tumblers!! Fav!